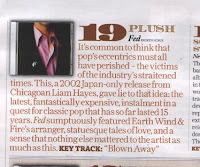 Plush's Fed has made number 19 in Uncut's end of year best of list (re-issue section). 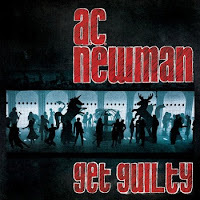 Up next on Broken Horse will be the terrific 2nd solo album by AC (aka Carl) Newman in early 2009. The album will be released on Matador in the US on January 20th and shortly after on Broken Horse in the UK/Europe. It really is a very special album and is more than an equal to his excellent debut album Slow Wonder and his work with the world conquering The New Pornographers. Carl played his first show with his new band last Saturday at The Bell House in Brooklyn. He was accompanied by rising star Nicole Atkins who sings back up vocals on several tracks on Get Guilty. Looks like it was a great night. At the time of writing, Metacritic has Fed at #3 in their list of the best reviewed albums of 2008, (ahead of Fleet Foxes, Bon Iver and Nick Cave...). Don't just take our word for it, check it out here. Record collector have also given Fed a glowing four star review. Patrick's 2nd album Orange Moonbeam Floorshow will land in early 2009. In the meantime, Patrick is currently living, performing and DJ-ing in Berlin. You can catch him on the following dates.